Makita XPH102 Review: A cordless drill is a versatile and necessary tool in any handyman’s arsenal. Having a high-quality cordless drill makes various repair and construction tasks faster and easier. Additionally, drills are required for numerous home improvement projects and going cordless will make things more convenient. With a cordless model, you will eliminate the need of finding an electrical outlet or lugging around a heavy extension cord. Today new products seem to slides in all the time. This makes it hard to track the best products from the junk ones. However, we have reputable brands that have withstood the test of time. One of these brands is the Makita. This brand gives you a sense of security while purchasing a power tool. After going through various Makita drill models available, there is one particular model that stood out. This is the Makita XPH102 18V LXT 0.5" Hammer Driver. In this article, we’ll discuss its features, uses, and its benefits over other products. The Makita XPH102 is a great choice for repairperson’s and avid homeowners who are looking for a dependable drill to help them in various projects. This drill is not only a perfect choice for skilled workers but also an inexperienced user who would rather do home repairs alone rather than hire a professional. The Makita XPH102 cordless drill kit is an ergonomic, moderate, and easy to use. This tool gives you the capacity of boring into various materials such as tiles, mortar, wood as well as concrete. Despite being a cordless model, you can expect the same power that you can get from electric powered drills. It is also an excellent choice for individuals looking for a lightweight drill that is more flexible to use. With this product, you can also screw, unscrew the fasteners, and drill holes with ease. Whether you are looking for a versatile or a heavy-duty drill that you can use around the home, the Makita XPH102 is an excellent tool. The Makita XPH102 18V LXT cordless driver combines high torque with speed into a small compact size. For increased performance, this tool run as a hammer driver drill or a driver drill giving you the convenience you need when tackling a variety of projects. This tool is also engineered for various applications in masonry and wood thanks to its powerful motor. The inbuilt four-pole motor has the ability to deliver up to 480-inch lbs maximum torque. It also offers up to 28.000BPM and 1900RPM in the high-speed settings. We also love its adjustable speed feature. This feature enables you to set the precise cutting speed, enabling you to cut different materials with absolute accuracy. Experts emphasize the importance of ergonomic and compact design. This has prioritized the user needs by bringing you a tool that is easy to control. This is facilitated by the lightweight, compact, and ergonomic design. We love the ergonomically designed handle that keeps your hands comfortable for long. This will minimizes hand fatigue, allowing you to work for longer. The tool has a combined weight of about 3.9lbs with battery. Besides reducing the user fatigue, this unit is easy to control, improving your precision. Similarly, the compact design will allow you to reach tighter spaces where other models cannot access. Sometimes, we may need to use both a mallet and a boring driver. Instead of purchasing two drills, you can take advantage of this tool from Makita. The combination of these two highlights in one compact device saves you a lot of money by purchasing two pieces of equipment. Besides, it will save you the inconvenience of carrying a heavy toolkit to the place of work. Another feature that makes this unit to stand out is the extreme protection technology. This technology makes it resistant to water and dust. This makes it ideal for use in the harshest job site conditions. Additionally, this will boost its performance and durability. The battery of this cordless drill is incredibly powerful. It is powered by a lithium-ion battery that can last up to three hours. This gives you ample of time to complete your project without having to break to recharge. What’s more, with a 20-30 charging time, you can resume back to your project promptly. The larger battery capacity and short charging time will enable you to spend most of your time working and less time waiting. In addition to the impressive battery, this drill is also accompanied by a star protection technology. This technology monitors the drill’s performance and protects any instance of overloading and overheating. By doing this, the drill will provide you with optimal performance for many years to come. Some of the other features that make this unit to stand out are the Inbuilt LED lighting system and 16 operating control systems. The control system makes it convenient when working on most materials and surfaces. On the other hand, the LED lights allow you to work in dark areas with ease. 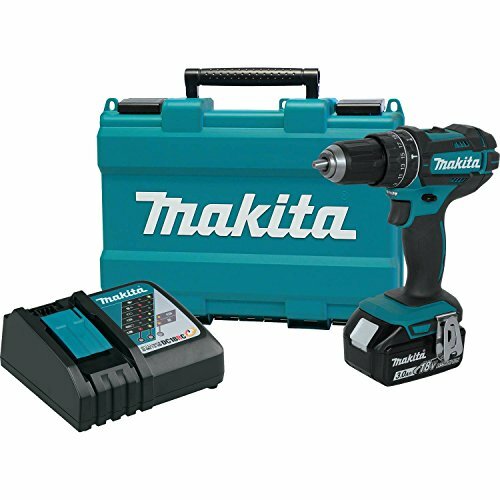 Makita is one of the brands that are reputable for quality, precision, and ease of use. The Makita XPH102 Cordless Hammer Driver is no different. In fact, this tool is the best in its class when it comes to power, durability, and convenience. Despite the stiff competition from another brand, the Makita XPH102 stands out when it comes to performance. This makes it a perfect choice especially if you are looking to replace your old cordless drill. We hope that our Makita XPH102 review has covered everything you need to know about this tool. Feel free to share your experience or ask any question in the comment box below if you need any further assistance.